If reality bites, why be bitten? I love the cynical humour of Scott Adam’s comic strip ‘Dilbert’. 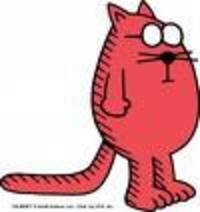 In a recent strip on my daily calendar, Dilbert’s cat stands on a table facing Dilbert, who sits in a chair nearby. The cat says to him, ‘Dilbert, you’ve become too aware of reality. I’m sending you to “Cynics Anonymous.”‘ In the next frame, the cat continues, as Dilbert looks increasingly annoyed, ‘A higher power will help you regain the naïve optimism that once made you a perfect employee.’ Brows furled, Dilbert asks, ‘Why can’t the higher power change me while I’m sitting here?’ The cat answers, ‘Fluorescent lights block his power.’I wonder how typical these notions are about reality and God. Do most people believe that an awareness of reality makes us cynical, and thus is not to be desired? Is the role of the god-like power to help us to become naïve or avoid reality? God is the author of all reality and can see and fathom all of reality. Humanity is at a disadvantage when it comes to comprehending reality, because our comprehension is limited by our context, experiences and preconceptions. However, I believe that a person who seeks to know God should have a firmer grasp on reality than those who do not. David, King of Israel, sings that ‘The Lord is my light’ and asks the Lord, ‘Teach me your way, Oh Lord.’ His heart tells him to ‘Seek God’s face.’ (Psalm 27) Does David believe that knowing God’s ways will bring to light the reality of his situation? Does ‘seeking God’s face’ entail a desire to know what is real? At the end of his life, David prays before the assembly of Israel. In the midst of a prayer of dedication of the temple project and handing it over to his son, David says, ‘Our days on earth are like a shadow, without hope.’ (1 Chronicles 29:15) This sounds cynical and not naïve in any sense. So, if a man who has sought to know God all his life perceives this harsh reality, is what is in store for all who want to know God? Is knowing what is real something that we should desire? It seems that perceiving reality could be depressing. In The Matrix, Neo had a longing for the Real, but he didn’t initially comprehend that reality was what he desired. And reality turned out to be a ‘desert’, to use Morpheus’s words. If reality is a desert-like, futile understanding of the world, then it is no wonder that people wish to avoid engaging with it. But, do people actually want to avoid reality or do they deep down desire to experience reality? Zizek argues that most citizens of consumerist societies live separated from reality. Do they desire this separation? From a spiritual perspective, I do not believe that Christians should try to be separated from reality. In fact, I think that the role of the church in society be to wake people up to reality. But we must be careful of what reality do we wake people to – the church at times has been guilty of presenting people with another false idea of reality to replace their worldly idea of reality. Drawing close to God could make us more aware of reality. First, this awareness of the spiritual reality would help us understand some of the forces at work and in tension around us. This perspective can give us joy, knowing that God is at work here and now and throughout history. But, this insight can also be distressing because we will see how meaningless people’s lives really are. Second, this awareness could give us an eternal perspective on our current situation, which can help us deal with the futility of our present reality.